This entry was posted by Ryan on May 22, 2011 at 3:21 pm, and is filed under Movies, Podcasts. Follow any responses to this post through RSS 2.0. You can leave a response or trackback from your own site. Aloha Ryan and Jen ! I’ve been waiting for so long to listen to new episodes of your podcast (i’ve been listening to all your lost transmition podcasts). Mahalo for this new one and for everything you’ve done already. I just listened to it and it felt great ! Maybe a little bit short, but i may think that way because it seems like i’ve been waiting for so long. Why is this number 53? Where are #’s 1-52? We cheated. We uploaded all our previous “Pith of Pop” talks going back to 2005 and counted those as well! Thanks for giving us a listen! Yes, it’s definitely not an hourlong show, but if we post something several times a week, does that make it better? Or worse? Had a chance to listen to the podcast today, great job as always. Thought this edition of Pirates was a bit better than the last two ventures. Jen lamented the fact there was a lot going on (some of it not really anywhere), well there was a lot more of this in the last two installments. And while I liked the epic scope of 2 and 3, I definitely saw a more focused effort in this version, which I thought worked fairly well. Like you said though, see this movie for Captain Jack and Hawaii. It’s actually better for this show right now. I’ll let you know how it feels as time passes by. It’s good to see that Popspotting is on the air, and I’ve enjoyed the first few episodes. Personally, I like the idea of semi-frequent quick hit podcasts over less frequent long-form ones. I already have a lot of 30-60 minutes podcasts in my iTunes subscription list and these Popspotting podcasts are like tasty bite-size snacks. And while I think the world of you guys and what you have done to advance the art (and business) of podcasting – and am somewhat loathe to criticize anything you all do in that vein – there were a couple of things about your Pirates 4 review that irked me. While it’s no crime to not have seen Pirates 2 and 3 (I happened to like them more than most, apparently, but that’s fine), I really believe that you should have at least reviewed the Wikipedia entries for those two movies before weighing in on the latest Captain Jack adventure. Had you done that, you would have known that the story of Keira Knightley and Orlando Bloom’s characters was wrapped up at the end of Pirates 3, as well as what became of the Black Pearl (it endured quite a lot during the middle two movies). These are but minor quibbles; thanks again for diving back into the world of pop culture and sharing your enthusiasm for it with us all. Thanks for your comment. 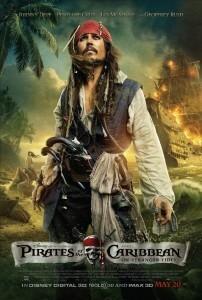 Some have said Pirates 4 was the best since 3! David, that’s a totally valid point! We disclaimed as much as we could that we clearly had missed a lot of the story, and to anyone who knew the history of these characters, our stumbling about must’ve been frustrating to listen to. Even with those missing pieces, I enjoyed the ride… obviously more than Jen did! I really liked the “small chunks” format. As much as I loved The Transmission it was sometimes hard to find the time to listen. It’s great Popspotting is finally up and running. Thanks so much for giving us a whirl, Nancy! We’re enjoying the “chunks” approach, too! Hopefully we can be squeezed in between some of our more epic-length counterparts!